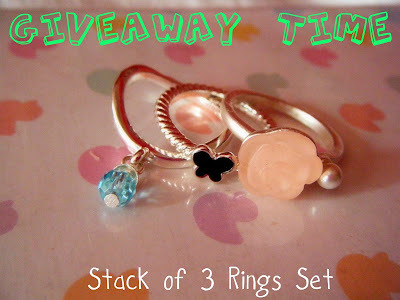 A Thing (or Two) About Holly Jean: Sunday Lemmings- Mad About Rings! Sunday Lemmings- Mad About Rings! Winners of last week's Sunday Lemmings- Watsons Haul giveaway are - 1. summer_ying (DHC Foundation) 2. Rica (StarLash) 3. JustiniaLow (Watsons Pore Strips). Congratulations, check your emails please! This floral ring i made by me! I've had it ages, and just love how big and pretty it is. I also get most of my rings from online shops which customise rings for me, or already have a good selection of self designed/ hand made pieces. Like Janthavenue.com where I got these 2 rings from. Another of my new favourites is the mini white rose from FingerFabulous. It's small enough to be a pinky ring, and it is adjustable so I can wear it on other fingers. This stained glass ring looks fragile, but actually it's made of metal and acrylic, not glass. Also from FingerFabulous. This blue grey cameo ring (FingerFabulous) is for days I want to have a vintagey feel (but it's not costly!). And for fun days, puffy rings!!! Hello cuteness! Once a girl, always a girl. I love Ballerinas! My favourite ballerina ring is one from Janthavenue. It's sparkly too. They have this design in pretty pink too. This flower ring is also from Janthavenue. Yes... I am a big fan of floral rings. I have all kinds. 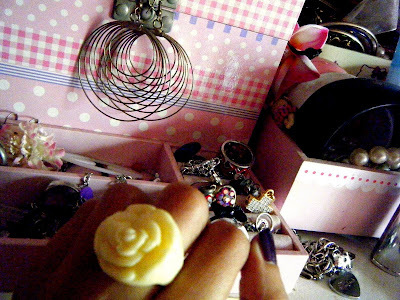 I love plastic rings too... though I don't have many of them as the ones in the store are usually quite big sized!!! This one fits my middle finger perfectly, and it's one of my precious pieces (I got it from closing down sale of Watts In). This on was sponsored by GUESS late last year. Rose gold, with black tones around the band, and a dangling star. Me loves it... I am also a fan of toe rings. This being my latest one. Whoop! All you need to do is erm... be the first person to comment and leave an email address. Congrats Daphne , you're the first. How do u buy rings from stores/blog shops if your fingers are so skinny like mine? I can never find anything that fits me. Do you custom resize them to your size? we might have some things you like. Check us out. Sorry everyone else, only the 1st comment gets the rings. (posting out tmrw). Some I order in my size ( Size 4 for my ring finger, 5 or 6 for middle finger). Best is when I get adjustable sized rings. Tht font is "Action Jackson "